AFC - 07/17/17 Hunting Law on Public Debate! The Ministry of Agriculture, headed by Minister Tolusic, is again listening to the voice of the public majority. After a public debate in 2015, and the great opposition from citizens to the killing of dogs and cats on hunting grounds and the introduction of hunting with a bow and arrow, the new Hunting Act draft takes into account both prohibitions! However, due to the pressure from some hunters, it is essential that all pet and wild animals caretakers engage in consultations with the interested public by July 23rd, 2017, and support these provisions in the proposal of the new Hunting Law. For years, the Animal Friends Association has been pointing to the obsolete article of the Hunting Law, which allows the "removal" of dogs and cats on hunting grounds, which hunters freely interpret by killing dogs and cats, even though they can move them from hunting grounds by ethical methods without killing them. The current draft proposal defines that "Owners should not allow dogs and cats to move on hunting grounds without supervision at distances greater than 300 m from the owner's residence". Some hunters are lobbying for the legalization of the assassination of dogs and cats on the hunting grounds, so the Association has proposed an addition to this article so that dogs and cats caught on hunting grounds are considered as abandoned or lost animals and the finders are obligated to take care of them in accordance with the provisions of the Animal Protection Act. In the detailed explanation of its proposal, Animal Friends has pointed out that the Criminal Law of 2013 introduced a directive on the torture and killing of animals as a criminal offense with a prescribed imprisonment sentence, while in the parliamentary procedure right now there is a voting procedure of a new Animal Protection Act prohibiting the killing of abandoned animals in shelters. 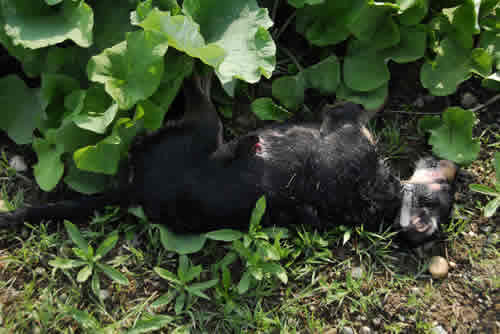 Luka Oman, president of the Animal Friends Association, said: "It is unacceptable for the Hunting Law to legalize the possibility of killing abandoned or lost animals on hunting grounds, even though the same animals are protected by other laws. It is unquestionable that dogs and cats feel the same pain and suffering regardless of whether they are located on hunting grounds or in the streets, and the laws must treat them same as well. If killing dogs or cats is forbidden for ordinary citizens, then it should be forbidden for hunters as well!" Numerous cases of arbitrariness by hunters in and outside of hunting grounds have been a major point of criticism for a long time. Many times hunters shot at dogs while a caretaker was just a few feet away from him, walking through the woods, or shot at a dog while he was still on his caretaker's land, sometimes even in the presence of children. Citizens do not want to fear someone shooting at them or their dog as they walk through the woods nor will tolerate that somebody's current or former pets become victims of brute force and killings by hunters or anyone else! The previous Draft of the proposed Hunting Law from 2015 had also introduced the possibility of hunting with a bow and arrow. This rightly caused great concern from the public, which is strongly opposed to any extension of the possibility of killing animals while hunting. Such hunting has always been forbidden in Croatia for a reason, and it should stay like that! Therefore, this Draft correctly prohibits a primitive and cruel hunting practice with a bow and arrow that causes a large number of wounded and crippled animals. The Animal Friends Association invites everyone to join the public debate and to praise and support the Ministry of Agriculture because the Hunting Law will finally repeal the killing of dogs and cats on hunting grounds and continues the prohibition of hunting with bow and arrow.